Programmable wireless thermostatic radiator valves (TRVs) can help home owners reduce the overall level of energy consumption in their guest rooms, as it will allow them to easily match the room’s heating pattern with the diary of anyone visiting, all at the touch of a button. Design experts believe that the overall look of a guest room can be seriously improved by replacing an older radiator with a modern version, including tall, upright, and vertical options, aluminium designs, designer radiators, and much more. This simple change could have a profound effect on the guest room on a whole. However, simply replacing the radiator with a new one won’t have a real effect on energy efficiency, and this is specifically where the HeatSave wireless TRVs can be put to good work. 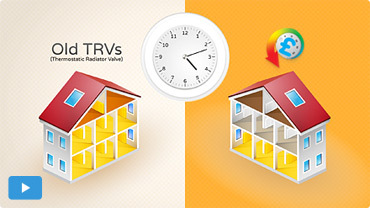 The HeatSave TRVs are designed to work with an extensive range of radiators and enable users to precisely control the activity of every single radiator in their home, and perfectly program it in order to match their own schedule and living habits. The HeatSave software, designed to run on any Windows™ PC, enable users to set specific functioning times for each valve. Since radiators are individually controlled, the HeatSave valves enable users to maximise the zoning potential and reduce energy consumption in those areas that are not used for longer periods of time (as for example, dining or sitting rooms and kitchens during the night, etc.). If you want to find out more about the HeatSave wireless thermostatic radiator valves, our team is eagerly waiting to answer all of your questions.